“Does a talented production specialist really find job satisfaction in pressing ‘next’ on a CG keyboard?” That’s one of the questions posed by Ross Video in its white paper outlining the reasons to implement its automated production control system, OverDrive. Automation, Ross supposes, is here to liberate people from their unfulfilling jobs while coincidentally saving their employers the associated costs. Half of all jobs in Canada will be disrupted by automation in the next 10 years, according to an RBC research study from March 2018. (The transcriptions of the interviews for this very article, for example, were generated by an automated transcriber.) Unsurprisingly, news media have undergone massive technological shifts in the past decade, from streamlining data collection with artificial intelligence to using automation software to generate images and characters on demand. Journalists have dealt with the shifts in technology and in the business of news with varying degrees of success and satisfaction. But it’s not just journalists whose jobs are disrupted by technical shifts in news reporting. On all platforms, journalism is supported by technicians and technical craftspeople. In broadcast news, skilled technicians have been relied upon to implement and deploy live programming since the foundation of TV news. However, conventional broadcast standards have been rapidly shifting in the last couple of decades. And as the focus of media companies switches to digital content, threats to the supremacy of TV have changed how televised content is made. Over the past three years, the CBC has had to upgrade, relocate and build newly automated control rooms across the country. Ten years ago, many experts said that 24-hour continuous style news programs would never be automated. 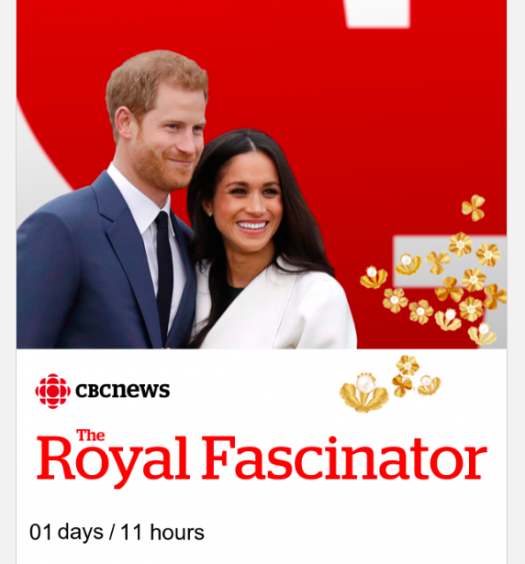 However, CBC News Network, CBC’s continuous news channel, has been successfully automated for a full calendar year as of this March. From the outset, this project was set to cut a dozen traditional job functions, according to communications issued by Jennifer McGuire, editor-in-chief of CBC News, and Fred Mattocks, general manager of English Services in June 2016. The communique emphasized that it would be roles cut, not people – implying that jobs would change, rather than disappear. 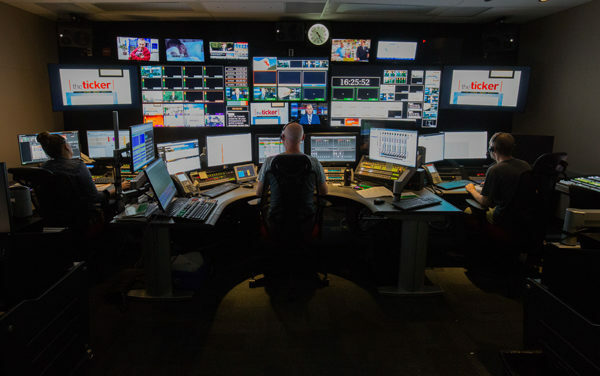 At News Network, automation has brought significant crew changes, though the “headcount” – business speak for personnel numbers – remains high compared to a regional control room. In essence, at Newsnet, five separate roles are now distilled into three new positions. The only control room role remaining mostly untouched is that of the associate director. For regional shows, the headcount is as low as two people in the control room, the switcher-director and the AD. While there are fewer bodies required to execute the news, the union band category and the salaries for each new role are higher than for the positions that automation made redundant. A Switcher-Director’s full-time base salary starts at about $68,389.18, based on an hourly rate, and tops out at $86,270.29. In contrast, a full-time font operator’s starting salary is $43,448.67, with the highest base salary of $61,936.61, according to their union banding. 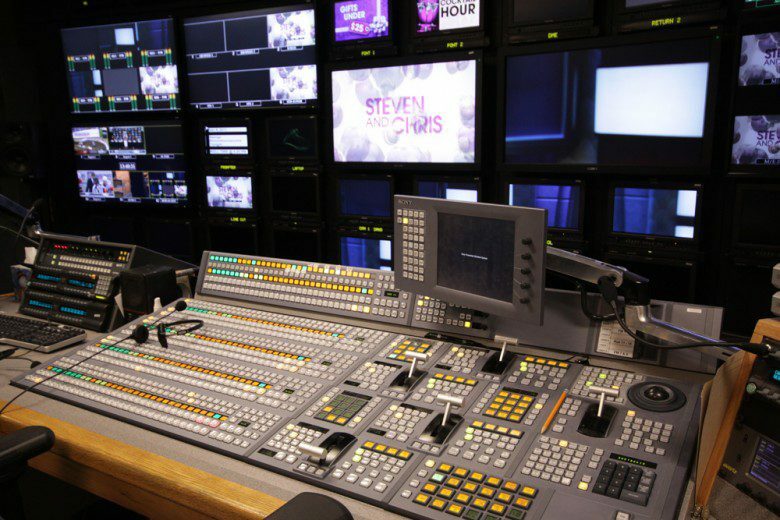 A production switcher’s full-time salary is between $50,892.39 and $70,654.66. These salaries are based on annualized hourly rates that went into effect in April 2018. Kathryn McNaught is one of the original Switcher-Directors hired by the CBC as part of the current project. She launched the first automated and centralized control room in Toronto, the Edmonton local newscast. McNaught, who previously worked at Global and Omni Television, came to the role having experience with automation (both OverDrive and MosArt) and worked in remote control rooms at Global. She has also spent time as an AD in conventional control rooms and studios. McNaught is not necessarily the typical hire for the new SD position mainly because there is no typical. As she put it, some new hires “hadn’t had that much control room experience,” while others are veteran switchers, audio mixers and directors. Mike Paquin, product manager for control and automation systems at Ross Video, would probably say that the varied technical background of the new SDs proves the efficacy of OverDrive. The purpose of the technology, according to Paquin, is to make a system so easy to use and intelligent, that a layperson, theoretically, could do a job that would have required a specifically skilled technician in the past. OverDrive requires its own new set of skills, but it streamlines more complex technical requirements allowing, in theory, one person to do more with less. So, where do all the skilled technicians go when their roles are made obsolete, or in public relations speak, redundant? Some have been given opportunities to train as SDs and ADs in the new control rooms. Some who were close to retirement retired. The remaining staff were shuffled to new roles in the corporation or they were given severance based on the union’s redundancy rules. For the freelance and casual technicians whose roles disappeared, it meant finding work elsewhere. Some were able to find work in the organization in different roles, while others had to look outside to fill the gaps. Jonathan Spence, CBC branch president at the Canadian Media Guild, said the union has pushed the corporation to communicate with its members the changes brought on by new technologies as soon as possible and with as much information as possible. For those whose roles change, he said the union is there to help members transition to new ones and adapt to the changing technological landscape. In the case of remote and automated control rooms, the announcement of the project initially came in 2014. As explained by director of news operations, Carl Swanston, the project involved two distinct parts: the centralization of local and regional control rooms into three main hubs, Vancouver, Toronto and Ottawa, as well as the conversion to a new automated production control system. While this project was immense, Swanston emphasized that the concept of automation is not new to CBC. It has been around in some form for the better part of two decades. 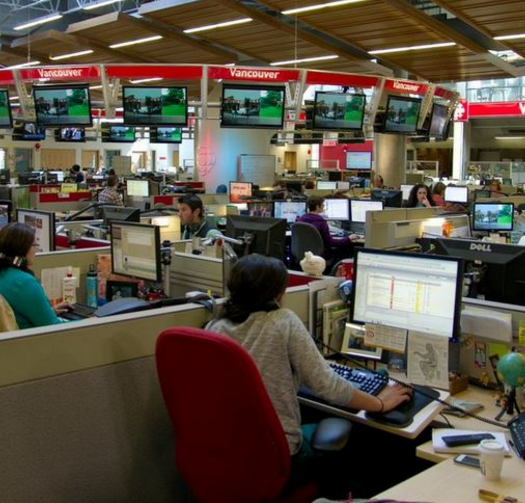 However, the conversions of The National (as CBC’s flagship news program) and News Network (a particularly complex operation as it involves continuous 24-hour live news programming) control rooms to automation was a new challenge for the corporation. The new system of automated control rooms has reduced the number of technicians required to implement any given broadcast. The primary system used for this project was OverDrive by Ross Video. OverDrive is an automated production control system that allows one operator to have control over multiple broadcast elements. In conventional, manually operated control rooms, audio mixers, video servers and graphics channels are run separately and require their own operators. APC allows for each individual piece to come together and function as one. The OverDrive system has been “on the air since 2004,” according to Ross. APCs have been used all over the world and two of the other most prominent systems are MosArt by VizRT and Ignite by Grass Valley. Global TV News has been using MosArt since 2012 and CBC French services was using Ignite prior to the switch to OverDrive. Before APC, each component of the broadcast had to be manually operated by human operators. To put up a banner or a name key on screen, for example, a person would use a keyboard to animate the graphic (sometimes called CG, font or chyron) on and off the screen. The timing was at the discretion of the operator, acting on the directions of the director or based on the associate director’s verbal time cues. The same was true for every other component: if a microphone needed to be turned up, the audio mixer turned it up; if the director wanted to see camera 1, then the switcher would “take” that camera; if the host threw to a clip, the playback operator had to have it cued up for the switcher to take. With APC, the director and the switcher/audio operator/font operator/playback operator are all in one role. So, individual variances are mitigated by the fact that there is only one operator working through a preset playlist, known as a lineup. APC relies on each element being coded into the lineup. This means that any errors in the coding can lead to unexpected glitches. And with fewer skilled technicians and operators in the room to troubleshoot any individual issue, it means that sometimes a lone operator has to problem-solve technical issues on their own. In theory, if the lineup is coded perfectly and if the operator hits each sequence in the correct order and if no equipment fails then the show should be clean and go exactly as planned. That is one of the selling points of an APC system; with fewer people, and less equipment, a consistent show can be put to air without compromising quality. The one deficiency that has plagued APCs is that they are only as flexible as their coding. In a breaking news situation, the fear is that an APC might struggle to keep up as editors, producers and directors scramble to go off a preset path. Automation has allowed the CBC to significantly save on capital costs because in conjunction with converting to APC, the production control for programming across the country has now become more centralized. Centralization of regional and local control rooms to remote hubs has allowed for savings as seven English services control rooms were due to be upgraded from standard definition to high definition for English services. Interestingly, French services have converted to automation, but only in the regions where they are present alongside the English newscast. Swanston said this is for consistency reasons so that both crews and production teams are converting at the same time. The cost of building a new control room is about $3 million, according to the CBC’s own communications. Thus, with remote production, one control room can now function for multiple shows, requiring fewer to be built. This is aided by Canada’s varying time zones, allowing one control room and one team to do multiple supper hour shows live in separate time zones. Remotely producing shows from central hubs not only reduces capital costs for constructing the rooms and purchasing the equipment, but it also reduces the real estate footprint. As the CBC moves away from owning buildings, the desire to reduce the space required to produce content has increased. Centralization and remote production is already in place at Global TV in Toronto. In fact, Swanston visited its facilities prior to the launch of the CBC’s remote scheme. At Global, almost everything is done remotely, called a multi-market content unit, with hosting and editorial teams located in Toronto. In the CBC scheme, regional hosts and editorial teams remain in their local regions and only the control room is located remotely. Another potential consequence of automation is skills drain. As automation improves, there are fewer spaces and opportunities for specifically skilled craftspeople and technicians. Swanston said keeping skilled technicians, like switchers and advanced audio professionals, in the building is important for the CBC. Granted, he also said he’s reached out to various colleges to insist they start to teach their students automation and to phase out conventional control rooms; “We’re not hiring audio and switchers, we’re hiring switcher-directors.” As it stands only one college in Canada, Nova Scotia Community College, is teaching the OverDrive Production system to its students. In the future, the skill of a manual switcher in broadcast television may become as niche as that of a manual printing press operator in print media. For now, however, those skills are still in demand, especially for large-scale live events and sports. According to the corporation, the switchover to remote and automated control rooms has had minimal effects on staffing and program quality. Words like “seamless,” “flawless” and “without a glitch” are frequently floated in the communications sent corporation-wide by Swanston and news operations. Of course, the definitions of “seamless” and “flawless” are up for interpretation. Erika Owens, an expert in the intersection of media and technology and the director of OpenNews.org, explains that “burnout” is a major buzz word for the media industry as a whole. While the bar is being raised for the quality and quantity of content, the number of resources each individual receives is dwindling. As Owens put it, “people are being pulled in a lot of directions,” without much clarity on the future of their career and of media as a whole. The most challenging part of transitioning to new types of technology is not the technology itself, according to results from the OpenNews “2017 News Nerd Survey”, rather it is the shift in workplace culture. The guild’s Spence said “workload” language and the need to avoid overburdening individuals is an issue the union has faced before and is prepared to discuss again. At the CBC, the union is working to ratify a new tentative agreement. When I spoke to Spence in March 2019, the agreement had not been voted on yet. According to the explainer on the tentative agreement issued by the union, the corporation is resisting wage increases based on new funding and instead has insisted that funding goes toward “boosting programming.” According to the union, “stability in this economic and political climate” has meant it will not push the wage increase issue. The concept of an unstable media market has left workers in a tenuous position and new technology can increasingly appear alarming to a labour force already on edge. For the technicians who are left in the same roles from before transition, mainly camera operators and lighting technicians at News Network and the National, the switch to automation, though it loomed for years, has been disconcerting. The new system has caused some anxiety among the rank-and-file technicians and operators, even if, as Swanston said, their jobs haven’t fundamentally changed. As Spence surmises, though he admits he can’t verify his theory, some of this may come from underlying anxieties triggered by job cuts for austerity purposes in the CBC’s recent history, such as the hundreds of layoffs between 2008 and 2009. So, while “seamless” may be an overreach, this is not to undersell the achievements of the news operations teams. As of 2018, 10 shows had successfully transitioned to remote control production and both the National and News Network have adopted and operate using OverDrive. It’s been 16 months in the SD chair at the CBC for Kathryn McNaught and on any given week she personally feels good about three out of her five shows and thinks two of them could have gone better. This is mainly due to growing pains, as fewer people available to troubleshoot means the SDs have to learn on the fly, each of them holding themselves to their own high standards. However, shows consistently go to air and the people the system relies on to execute the show are increasingly growing more comfortable and adept in their new roles. India McAlister is a freelance writer and copy editor in Toronto. She is especially interested in the intersection of technology and the labourforce. She also moonlights as a freelance floor director, including at CBC News Network. She is a graduate from Sheridan’s postgraduate Journalism - New Media program and received her Bachelor’s degree from the University of Toronto. You can reach her on Twitter @indiagmcalister.